For the 18/19 season, Line is overhauling their women’s Pandora line, which will consist of the Pandora 84, 94, and 104. We’re huge fans of the old Pandora 110, and a bunch of our reviewers still use that ski as a daily driver. And when you add on the fact that the Pandora 104 is the women’s equivalent to the men’s Sick Day 104 (a ski that many of our male reviewers really, really like), that makes the new Pandora 104 an extremely intriguing ski. Line is not only marketing the Pandora 104 as a 1-ski quiver for the resort, they’re basically saying it’s the complete 1-ski quiver — both backcountry and inbounds. 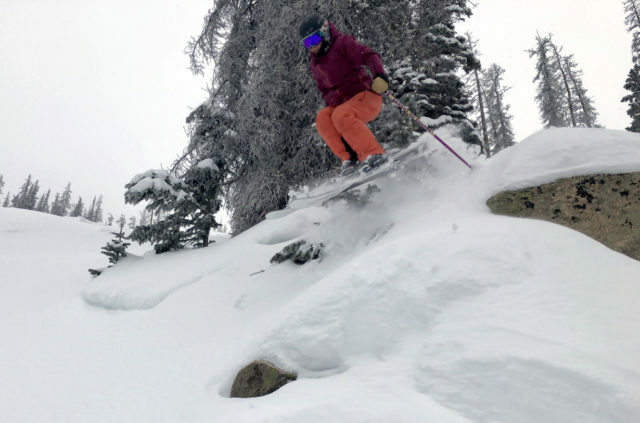 While we normally scoff at claims like this, the Sick Day 104 is one of a few skis that we actually do think would make for a solid 1-ski quiver for both the backcountry and resort. So we’ve been keeping this in mind during our testing to see if the Pandora 104 feels similarly versatile. The Pandora 104 has the same exact stated dimensions as the men’s Sick Day 104 (137-104-121 mm), and our measured dimensions for the 165 cm Pandora 104 and 186 cm Sick Day 104 are very similar. Both of these skis have a good deal of taper in the tips and tails compared to many other ~105mm-underfoot all-mountain skis. Compared to the old Pandora 110, the Pandora 104 has a slightly straighter tail, but overall, their shapes are fairly similar. In terms of its rocker profile, the Pandora 104 has fairly deep tip and tail rocker lines for a ski of this width, and this makes sense given that it will be Line’s widest women’s ski for 18/19. With that said, the Pandora 104 doesn’t have nearly as much tip and tail rocker or splay as the Liberty Genesis 106, and the Pandora 104’s rocker profile does still look like it should offer a nice blend of firm- and soft-snow performance (which was true in the case of the Sick Day 104). We’ll include more info on how the flex pattern of the Pandora 104 compares to a few other women’s ski soon, but we expect it to feel very similar to the flex pattern of the Sick Day 104. The Sick Day 104 has a nice, fairly round flex pattern with pretty soft tips and tails and a strong section in the middle. That translated to a very predictable, forgiving, but still quite strong ride on snow, and we expect a similar experience with the Pandora 104. The Pandora 104 shares the Sick Day series’ lightweight construction, and our pair of the 165 cm Pandora 104 is coming in at around 1635 grams per ski, which is quite light. However, one of the defining characteristics of the Sick Day skis is their impressive stability-to-weight ratio, so we’re optimistic about the Pandora 104’s stability. (1) We really liked the Pandora 110, so how similar or different will it feel compared to the Pandora 104? (2) The new Pandora 104 is significantly lighter than the old Pandora 110, and most other skis in its class. So how will it compare to heavier skis when it comes to stability in rough snow? (3) The Pandora 104 will be Line’s widest women’s ski for 18/19, so will it feel like a ski best reserved for pow days? Or, like the Pandora 110, will it feel like more of a wider all-mountain ski? As the successor to the Pandora 110 and the sister ski to the Sick Day 104, the Line Pandora 104 has a lot to live up to. And based on its specs, it looks very promising. We’ve spent a lot of time on the Pandora 104 this season, so stay tuned for updates, and let us know about any questions you’d like us to address in our full review. The Pandora 104 is the widest ski in the Pandora series and, based on what Line had to say about the ski, I was curious to see if it could truly float in deeper powder as well as wider skis. But despite its narrower waist (compared to other dedicated pow skis), I was impressed by how well the 165 cm Pandora 104 floated in the ~9″ of fresh snow I got it in. Sascha Anastas on the Line Pandora 104. The Pandora 104’s tip rocker helped keep its tips from diving in deeper snow, and I could keep the tips up without having to sit in the back seat (for reference, I’m 5’1, ~103 lbs). Because of this, I could ski the Pandora 104 with a more neutral stance and felt like I could more easily control the Pandora 104 than I could the wider (and heavier) Pandora 110. It’s not quite as loose and surfy as the Prior Flute or K2 Gottaluvit 105Ti, but the Pandora 104 was still easy to turn in pow without the tips hooking up unpredictably. 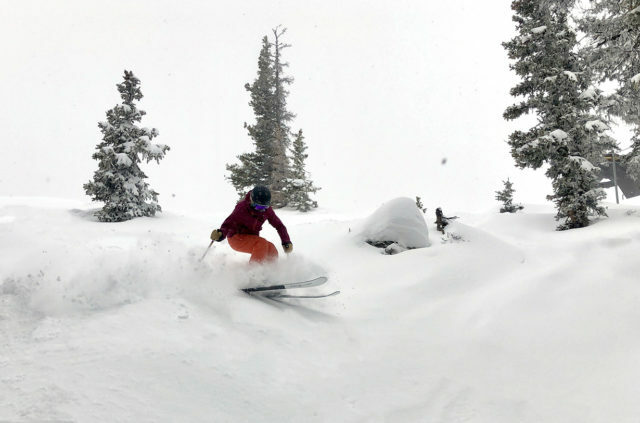 If you’re looking for a ski to use on really deep days, you might be better off on something wider (e.g., Blizzard Sheeva 11 or Coalition Snow Abyss). But for all the pow days I’ve had on the Pandora 104, it’s provided plenty of float. The Pandora 104 had no problem floating to the top of softer chop and skied-off powder. It was able to maintain speed for the most part without getting bogged down, and the ski remained pretty stable when driving it and cutting through soft chop. In heavier / more set-up chop, I tended to shorten my turns on the Pandora 104 to stay in control and keep the ski from getting deflected, which was something I didn’t have to do as much with the wider, heavier Pandora 110. In firm chop / crud, I tend to initiate my turns with more of a hop — jumping over rougher patches and making turns in smoother snow. The Pandora 104 made this very easy because of how light it is. When making quick turns through crud, the Pandora felt pretty smooth and didn’t chatter much. That said, if you are someone who wants to plow through firm crud and / or surf on top of chop, I would recommend a wider and / or heavier ski such as the Armada Trace 108 or Nordica Santa Ana 110. But ultimately, I found the Line 104 to be plenty stable in chop and crud for my skiing style. 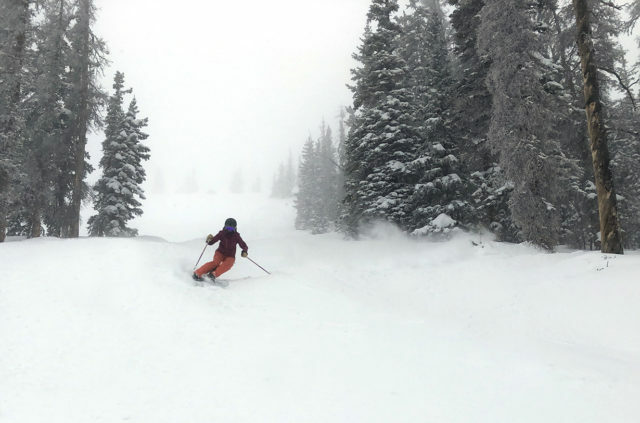 On steeper terrain like Highland Bowl and West Basin and Kachina at Taos, I tend to feel most confident on a ski that is more stiff and damp than it is surfy. Here, I want a ski that can edge into the snow with precision, rather than slarve / slide. I found the Pandora 104’s moderate, but still strong flex pattern, low weight, and good edge hold ideal for this sort of steeper and tighter terrain. The Pandora 104’s fairly subtle tip and tail rocker made it feel precise as it allowed for more edge to be in contact with the snow compared to the previous Pandora 110, as well as other skis with more rocker like the Prior Flute. The Pandora 104 also felt pretty versatile in terms of turn shapes / sizes, which made tight turns in the trees just as fun as holding longer-radius turns on steeper, more open bowls. That said, if I was skiing steep terrain in really deep snow, I think that I would opt for a wider ski to get a bit more float. For a wider ski, the Pandora 104 was quite easy to get on edge, which was one area where the previous Pandora 110 was lacking. This could be because this ski is a bit narrower, but even compared to other skis of similar widths such as the DPS Zelda 106, Prior Flute, and Liberty Genesis 106, I was very impressed by how the Pandora 104 performed on groomed snow. The Pandora 104 was quick to respond to small inputs and initiate a turn, and felt energetic when coming out of a carved turn. At the same time, the Pandora 104 is quite damp for how light it is. The Pandora 104 felt like it was most comfortable making larger GS turns on groomers, but was still incredibly maneuverable and quick to initiate smaller, tighter turns. The Pandora 104 is the widest ski in the Pandora series, so I would be curious to see how the Pandora 84 and 94 compare to this wider model on groomers. But for its width, the Pandora 104 is quite good on piste. Similar to its performance on groomers, the Pandora 104 is much more capable in bumps than the previous Pandora 110. Some of this probably comes down to the narrower waist and lower weight of the new Pandora 104, which made it feel easier to pivot and more forgiving overall compared to the Pandora 110. 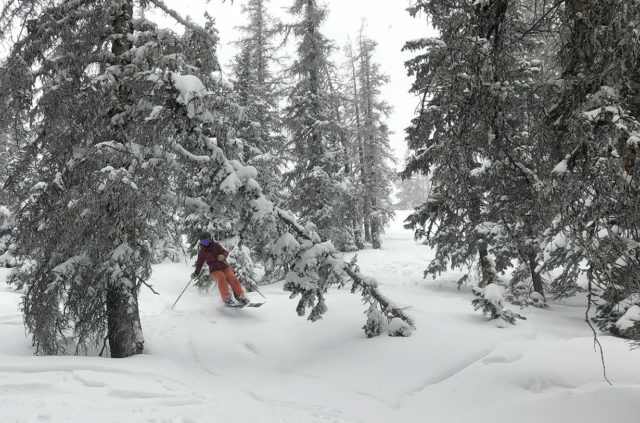 In larger, more rutted-out moguls, the damp feel of the Pandora 104 really stood out to me — the ski felt surprisingly composed and did not chatter much in the rutted, hard-packed troughs. Though, if I were to spend the majority of my time in moguls, I would opt for a narrower ski such as the Liberty Genesis 90, which is also quite damp for its weight. The Pandora 104 isn’t the most playful ski in its class, but it is still energetic, poppy, and nimble when transitioning from turn to turn. It doesn’t take a lot of input to get the Pandora 104 on edge, so it feels pretty quick to turn. Because of this, the Pandora 104 feels a bit more playful than the previous Pandora 110. The Pandora 104 is also pretty light, which makes it easier to get up in the air or to initiate jump / hop turns. That said, the Pandora 104 is not as surfy and loose as skis like the K2 GottaLuvit 105Ti or Prior Flute. Given how light, versatile, and stable the Pandora 104 is, I am confident that it would be a very good choice for a 50/50 ski in an area like Colorado where you often get a mix of firm and soft snow. 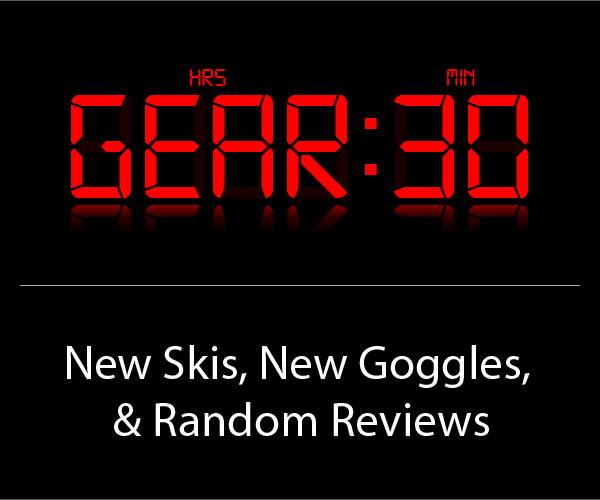 I think the Pandora 104 could work for a wide range of skiers, from intermediates to experts. 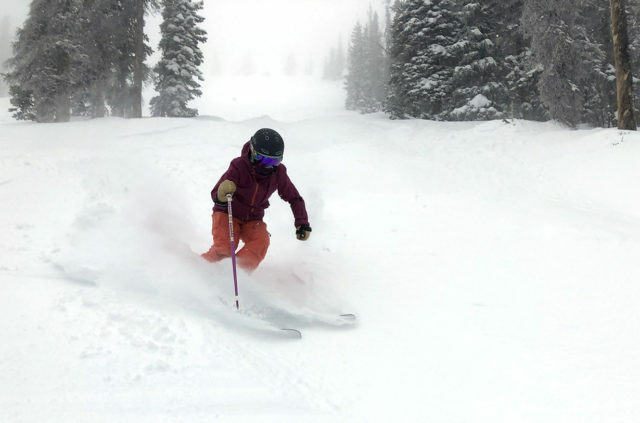 If you want a wider all-mountain ski that can float in pretty deep pow, maneuver easily though trees and steep terrain, carve turns at moderate speeds, yet also hold an edge at higher speeds, the Pandora 104 is a great option. I think the Pandora 104 would be a great pow ski for an intermediate skier because of its maneuverability and low weight, but if you’re just learning how to carve turns and are looking for a 1-ski quiver, one of the narrower Pandora’s might be a better option as they should be easier to get on edge. The Line Pandora 104 is a light ski that’s still pretty damp and stable and that performs very well in a wide variety of terrain and conditions. It can carve powerfully at high speeds, yet also surf around in powder. It certainly lived up to its predecessor the Pandora 110, which is a difficult thing to accomplish. While Line markets the Pandora 104 primarily as a powder ski, I would be happy using it as my everyday ski in a place like Colorado, rather than just keeping it in the closet for all but those super deep powder days. In the end, the Pandora 104 proved to be a very versatile ski that I have a hard time leaving at home when testing other skis.